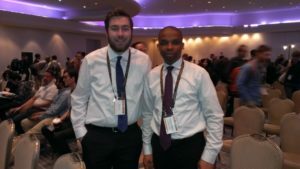 Dr. Adegbege, an Electrical Engineering professor at TCNJ, and two students, Terrence Skibik and Jeffrey Sabo, attended the IEEE Conference on Decision and Control to present the results of their research papers. The CDC is recognized as the premier scientific and engineering conference dedicated to the advancement of the theory and practice of systems and control. Every year, the CDC gathers a global community of researchers and practitioners in the field of automatic control to confer about their findings, perspectives on future developments, and the implementation of innovative and fresh ideas. There were over 2000 papers presented over the three days on topics drawing from game theory, power systems, cyber-physical systems and security, machine learning, robotics, transportation networks, autonomous systems, biological systems, power electronics and process control etc. 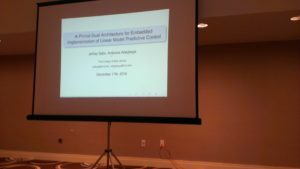 During the conference, Dr. Adegbege co-chaired the regular session of “constrained control” while Terrence Skibik and Jeffrey Sabo presented their respective research papers entitled as follows:. 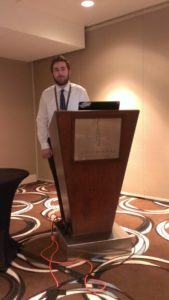 The CDC website that includes abstracts from many papers presented at the conference including TCNJ students Terrence Skibik and Jeffrey Sabo can be viewed here. Below are some images from the conference.